Under the title Gli impresari, The Impresarios – i.e. the directors of the theatre troupes that Nikolaus I, Prince Esterházy engaged to perform in his opera houses – this CD gathers together some of the orchestral works by Joseph Haydn linked by their origin and their reception; they were originally conceived as theatre music, before their metamorphosis into symphonies (…). The period from 1772 onwards, when Karl Wahr was responsible for for the summer theatre programme at Esterháza, saw the peak of the multidisciplinary collaboration taking place between the court music directed by Haydn and companies engaged from outside. (…) At the end of 1775 and the beginning of 1776, while Joseph Haydn was occupied in transforming his music for Collé’s comedy into a symphony for concert performance, Karl Wahr was enjoying enormous success with his theatrical entertainments in the ballroom at the theatre in Salzburg. It was there, on 3 January 1776, that Thamos, King of Egypt was staged, a heroic drama whose choruses, musicologists now believe, were composed by none other than Wolfgang Amadeus Mozart; for this Salzburg performance he also composed four instrumental entractes (recorded for this disc) as well as a melodrama and a Don Giovanni-esque descent into hell. Giovanni Antonini’s widely-acclaimed ‘Haydn 2032’ cycle of the composer’s complete symphonies continues apace on the Alpha label. 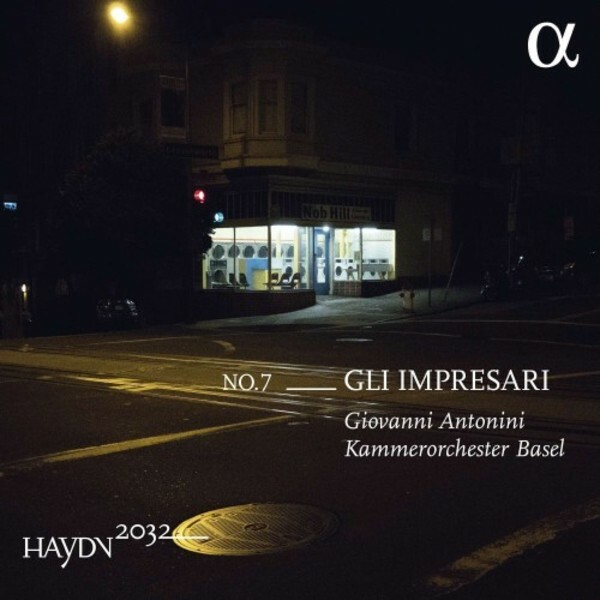 The latest volume is entitled ‘Gli impresari’ (‘The Impresarios’), reflecting the significance of the Eszterháza court theatres for Haydn’s symphonic output. The symphonies themselves – nos.9, 65 and 67 – are not among Haydn’s best known, but together they make a peach of a disc, coupled with incidental music by Mozart for Tobias von Gebler’s heroic drama Thamos, König in Egypten (‘Thamos, King of Egypt’). All have about them that ‘whiff of the stage’ that Haydn scholar H.C. Robbins Landon identified in no.65 in particular. The disc opens with one of Haydn’s most original symphonic creations, the Symphony no.67 in F major. Composed around 1775/76, its roots appear to lie in a performance of the comedy Die Jagdlust Heinrich des Vierten (a German translation of Charles Collé’s La Partie de chasse de Henri IV). The play’s hunting theme is reflected in the bugle call figuration of the opening Presto, the only example of Haydn opening a symphony with a 6/8 fast movement without slow introduction. The following Adagio corresponds to the music of the drama’s second act, particularly the striking use by the strings of col legno (striking their strings with the wood of their bows), imitating the royal hunting party trampling through the woodland undergrowth. Other notable features are the bucolic Trio of the Menuet, scored initially for just two solo violins, the lower of which tunes down its G string to F to play a hurdy-gurdy-style drone. It’s an enchanting effect, brilliantly realised, as so much else in this symphony, by the Basel players. The Allegro di molto Finale contains another surprise: its own embedded slow movement, an Adagio initially scored for string trio (two violins plus cello) which is taken up by the whole orchestra before a final return to the music of the Allegro. Mozart’s 1776 entr’acte music for Thamos gives the trumpets and timpani of the Kammerorchester Basel a chance to shine (they are not used in any of the Haydn works here). Much of this music foreshadows the more demonic music of Don Giovanni, which still lay a decade ahead, and the musicians clearly enjoy themselves in this demon-strative vein. The final movement is a thrilling descente aux enfers which finds Antonini and his players at their dramatic best. Recent research by the Haydn 2032 project has revealed links between the Symphony no.65 in A major and the popular ‘lustspiel’ Der Postzug oder die noblen Passionen by Cornelius von Ayrenhoff. Christian Moritz-Bauer, who writes the excellent booklet notes to this release, links the Andante second movement with lines from the hero, Major von Rheinberg, while the metric displacement in the Menuet clearly references the tavern musicians praised by the heroine’s mother. As for the Finale, it’s a rollicking hunting movement, complete with braying horns, worthy to stand alongside such better-known Haydn symphonies as no.31 (the ‘Horn Signal’) and no.73 (‘La Chasse’). Once again, Antonini and his colleagues have a high old time in this music, and the listener is totally swept along with their matchless phrase-shaping and infectious rhythmic buoyancy. The disc closes with the three-movement Symphony no.9 in C major. Moritz-Bauer links this work to the 1762 arrival of a troupe of Italian comedians at Eisenstadt, where they performed several commedie. The symphony probably served as prelude to a secular cantata on the occasion of a performance by the troupe. It has a rousing opening movement, with horns once again prominent, and a particularly beguiling central Andante featuring ethereal flutes rather than the more rustic oboes of the outer movements, before closing with a stately Menuetto and Trio. This is another splendid addition to Antonini’s ongoing Haydn project, and more than holds its own with other discs in the series. A perfect blend of scholarship and vibrant musicianship, it is complemented, as usual, by handsome artwork from Magnum Photos, in this case by photographer Peter van Agtmael.